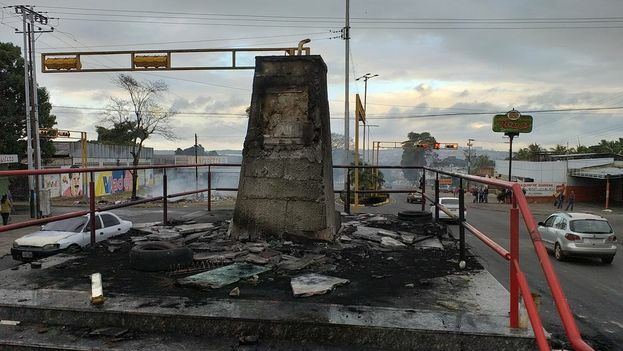 14ymedio, Yoani Sanchez, Havana, 26 January 2019 – If the populists share something, in addition to believing that they embody an entire nation, it is their inability to cede power when their project is exhausted. The decision to cling to the helm, no matter what the cost, has been shared by numerous caudillos in Latin America, but Nicolás Maduro in Venezuela is the most recent and dramatic case. Repudiated by a good share of Venezuelans, designated as a dictator by a large number of governments, and proven incapable of getting his country out of an economic quagmire, the successor of Hugo Chávez ignores all signals. Maduro is wedded to power more to save a ruling elite than to seek the wellbeing of more than 30 million people. He believes that if he remains in the presidential chair, Venezuelans will end up wearing themselves out and that exhaustion, together with the repressive blows, will pacify the popular protests that have shaken the South American country in recent days. He is playing the card of not accepting that his time has passed, and of baring his teeth to anyone who advises to him to get out of the way, call elections or seek asylum. In part, he clings to the presidential chair to avoid the judicial process that awaits him for plundering one of the richest nations in the world, for having pushed hundreds of thousands of Venezuelans into exile, and for having ordered the armed forces to use their weapons against ordinary people. But while trying to delay the judgment of his compatriots, Maduro leaves Chavism with no chance to escape the judgment of history. Every day that he remains in the position of president, a position he usurped after an election riddled with irregularities, he destroys what, in the collective imagination, could still be his predecessor’s legacy. Neither opponents nor right-wing governments in the region have been as effective as Maduro in dismantling the myth of Hugo Chávez. It’s no wonder, on the second night of protests this convulsive January, that demonstrators in San Felix, in the state of Bolivar, set fire to the statue of Hugo Chavez, the one-time commander of a Parachute Battalion who managed to install himself in the Miraflores Palace. These flames were directed at the entire Chavista myth which, at the end of the last century, installed the first bars of the cage that Maduro tries to keep shut today. By proclaiming himself interim president of Venezuela, the young politician Juan Guaidó, who as of this month is president of the National Assembly, has not only managed to bring the Venezuelan issue to the center of international attention, but has forced all those who supported the eccentricities of that soldier who sang in his speeches and believed himself a reincarnation of Simón Bolívar to look in the mirror. Not a few of those fervent followers have hastened to chant a belated mea culpa in recent days. Today Nicolás Maduro is Chavism’s main gravedigger, the most effective resource to dismantle a whole system which, in the beginning, attracted applause from millions of followers all over the planet. However, along with that ideological funeral, every day in which the Venezuelan ruler remains in charge, the tragedy of the country deepens. Until last Thursday, the non-governmental organization The Venezuelan Observatory of Social Conflict (OVCS) estimated the total number of deaths in protests against Maduro at 26. The economy is paralyzed and thousands of citizens are escaping across the borders every day. The stubbornness of a handful of Boliburgueses – the new rich ‘bourgeoisie’ of Chavez’s “Bolivarian Revolution” – has spread the uncertainty about where the country is headed and fanned the specters of a bloodbath. The support they enjoy from the military leadership could bring this bloody scenario closer, because – like all populists – they prefer to drag down the country they once claimed to represent before acknowledging that they failed. It is up to the international community to guarantee that, in the historical abyss into which Nicolás Maduro is plummeting, there is room only for the gang that governs Venezuela and for the authoritarian Chávism that elevated it.